Hi everyone. Thank you for all the purrs and prayers for my sick kitties, they are greatly appreciated. We have a Chewy Review today. I let Millie have this toy all to himself. *We received the Ethical Pet Shimmer Glimmer Fish with Catnip Toy in exchange for a fair review. All opinions are our own. He was excited to smell the package. It is a good-sized fish. Colors vary, but Millie is quite pleased with his pink. He gives it 4 paws up. The Ethical Pet Shimmer Glimmer Fish with Catnip Toy is only $3.99. Click here to find out more information. And don’t forget orders over $49 include free 1-2 day shipping. 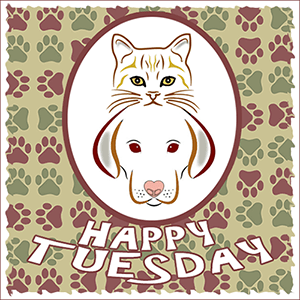 We are joining the Chewy Blog Hop and the Comedy Plus’ Happy Tuesday Blog Hop. This entry was posted in Blog Hops, Chewy Reviews and tagged #ChewyInfluencer, Comedy Plus Happy Tuesday Blog Hop, Ethical Pet Shimmer Glimmer Fish with Catnip Toy, Millie by pilch92. Bookmark the permalink. Millie, that looks like a great fish you have there! So bright and cheery against your white furs. We here are purring still for you and your furblings. And fur your pawrents who take such good care and concern for you all. Oh, that fish is very pretty! I hope you enjoy playing with it. It is 🙂 We hope you get one. I’m glad Millie enjoyed the toy! Millie, we bet you know just what to do with the fish! Now that’s a GREAT lookin’ fish toy! We sure hope the sick babies get better soon. We love that fish. You all have a good day. Awww, I am happy Millie enjoyed the pink fish! He does look pretty interested and pleased with it. Chewy done good today! Millie does look very pleased with that pretty pink fish. Our boys love catnip toys like that. Thank goodness I can comment here!! What a fun toy!!! We think Millie ROCKS the pink toy look! That looks like a fun fishie if ever there was one! Enjoy it, Millie! That pink is good look for you, Millie. Cool catch, Millie! Nice stuff! Purrayers for all the sick kitties everywhere. Pink is my favorite color so this wold have been purrfect here too. Sounds like a good toy! Thanks for sharing your review, Millie. You couldn’t wait to get that package open to see what you got. Looks like a good and fun toy to play with. Great seeing the cute photos with your fishy. Have a great day and have some fun now. Looks fun. And cute! Such pretty and vibrant colours, too. I am surprised they don’t. That is such a cute toy! Fish have always been Sam’s favorite, but she doesn’t have much interest in playing with toys anymore. Sorry she doesn’t like to play anymore. I love when Chewy includes cat toys for review! Millie, that is an awesome toy – enjoy it!! What a fun toy, and i’ll bet it smells delightfully like ‘nip. That’s a cute fish and goes well with his pink furz. That fishy toy looks like a purrfect plaything, Millie! We bet you had lots of fun with it. We are sending you lots and lots of purrs and prayers! Oh no. I’m behind on visits and hadn’t seen someone was feeling poorly. I hope they’re much improved!